Yes, I’ve been a negligent father – I didn’t blog about Ben’s release of Mathomatic for iPhone. It’s a very cool port of Mathomatic, an open source symbolic algebra engine that’s been around on the desktop for quite a while. 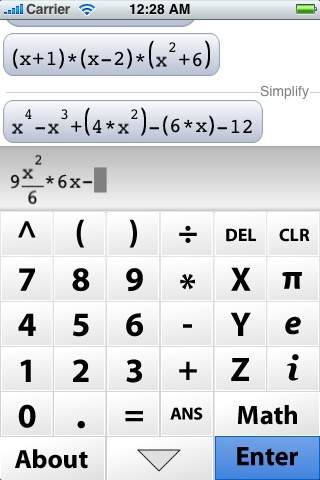 Ben’s integrated it into a very slick package, and the equation formatting and display is really top notch. Yeah, it’s pretty geeky, but I have to say it’s also VERY cool! Whether you’re doing homework, simplifying some equations for use in your own development work, or just want to be amazed at what you can do on an iPhone these days, it’s worth playing with – check it out! Default Folder X 4.1.1 is out! The latest fixes and improvements to Default Folder X are now officially available in version 4.1.1. The changes are mostly compatibility and bug fixes, but a side effect of one of them has been to speed up the login process in a lot of cases. DFX was asking the Finder for a list of its open windows while the Finder was still trying to get itself organized, and that could bog things down. So grab version 4.1.1 – you’ll be happy you did! Wow – it’s been a while! December flew by, what with the MacUpdate Bundle, a great trip to Vancouver (before the snow), family and friends visiting for the holidays, and all kinds of other distractions materializing out of nowhere. Now we’re seeing some fun feedback from the MacUpdate Bundle – new people discovering how great Default Folder X is. Murray Alexander at typepad.com wrote about how DFX makes his daily life on the Mac much easier. If you see any other “Default Folder X discoveries,” let us know! It’s great to see new people finding our software!